To prepare the mashed potatoes: Peel, halve, and cut the onion into slices ¼ in/6 mm thick. Melt 2 tbsp/30 g of the butter in a frying pan and add the onion. Cook over medium-high heat, stirring occasionally, for 15 minutes, or until golden brown. Peel the potatoes and cut them into medium chunks. Put the potatoes in a saucepan of salted water and cook over medium heat for 20 to 30 minutes, or until soft. Drain off the water and return the pan to the stove. Add the remaining ¼ cup/55 g butter and the milk to the pan and cook over medium heat until the milk comes to a boil. Smash the potatoes with a fork or potato masher until fairly smooth, stir in the caramelized onions, and season with salt and pepper. To prepare the salmon: Preheat the oven to 350°F/180°C/gas mark 4. Finely grate the zest of the orange and put it in a small glass bowl. Squeeze the juice from the orange and add it to the bowl. Add the honey and microwave on high heat for 30 seconds to soften the honey. Stir until combined. 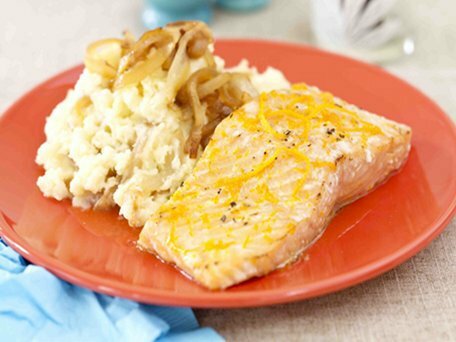 Put the salmon fillets in a foil-lined baking pan and brush with the glaze. Bake the salmon for 12 to 15 minutes, or until the insides of the salmon are just barely translucent. Put the remaining glaze in a microwave-safe bowl and heat for 1 minute, or until warm. Place one salmon fillet on each plate and spoon on the remaining sauce. Place some of the potatoes on each plate and serve immediately.